In a desperate attempt to get out of going to fat camp, sixteen-year-old Baltimore teen Bethany Stern tries what promises to be the last diet she will ever need—The Forgiveness Diet. 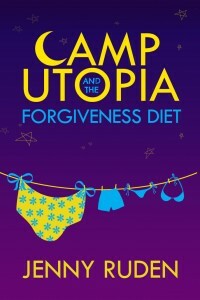 Where Louise Rennison and My So-Called Life meet John Green, Camp Utopia and the Forgiveness Diet is a contemporary account of a timeless teenage conundrum: how to conquer self-doubt, release grudges, and ultimately, grow up. 2010 was not the best year to start a novel, but I did it anyway. Truth be told, I had given up on writing, something that I don’t like to admit was surprisingly easy. After all, I had a job, a husband, and two children under the age of 4. Writing seemed decadent, frivolous, impractical. Yet, I kept coming back to it. And coming back to it was a struggle. I wrote about that struggle here and was lucky enough to win the AROHO nonfiction competition. That essay was an interesting piece that no one wanted to publish. I am grateful to AROHO for having the courage to do so. Later that year, my aunt died. At the risk of sounding dramatic, she did tell me on her deathbed that she hoped I’d use her money to finance my writing. She was a great woman, my aunt. She taught at Boston College for 40 years and encouraged young women to pursue things they might not ordinarily. After she died, I did exactly that. I quit my job. I put both of my children in childcare. I wrote a novel. I am grateful to my aunt as well as AROHO for their support.